Hotel Dion, conveniently located in the heart of Taichung near Shinkong Mitsukoshi Department Store, has a welcoming, friendly environment that extends beyond the guest rooms to its bar and restaurant. The bright, classically-decorated lobby is a comfortable place for visitors and diners, while the hotel's cafe provides all kinds of freshly-made juices, coffees and tea drinks. The friendly wait staff and beautiful Tiffany lamps also add an extra measure of warmth and comfort to the restaurant. Manager Vivian is happy to introduce the hotel's delicacies, which include light meals, hotpots, Chinese and international entrees, cocktails and a variety of wines (NT$600-2,400). Left: The Pomelo Tea (hot NT$200) features a mix of apple, pineapple, lime and pomelo juices, with no sugar added in order to accent natural flavors. 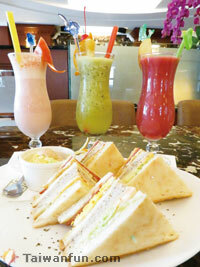 Right: The Club Sandwich (NT$250) contains tuna, cucumbers, black pepper, ham, eggs and lettuce. Tomato Juice with Milk is a lovely pink-colored drink that gets its sweet-and-sour flavor from the tomatoes. 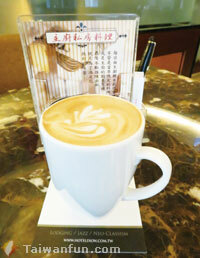 Kiwi Juice, Fresh Pineapple Cranberry Juice (NT$180) and other juices are fresh-made. Left: The Banana and Chocolate Waffle (NT$200) is made with eggs, the restaurant's original waffle mixture and other fresh ingredients. Right: Chef Oris Tsao uses seasonal ingredients and his personal creativity to come up with fresh, original dishes every month. The pictured Portuguese Prawns (NT$350 with black/green tea, soup, dessert) is a slightly-spicy entree made with a bit of coconut milk, plus natural herbs and white wine.